- Space for 7 groups, with 5216 mm. - Transportation belt with graphited nylon brackets, sliding over rectified steel guides. - Forward speed varying from 10 to 208 m/min 4 CV motor. - Press with rubberized pulleys and shielded bearings. - Maximum panel height of 8 to 60 mm, minimum width 90 mm, working minimum length 150 mm. - Equipment according to NR12 rules. - Automatic anti-gluing spray to avoid glue excess on the panel edges. - Automatic Double Spokeshave with individual oscillating tools, motor 2 CV, 12000 rpm, axis Ø 20 mm. - Suction nozzle Ø 100 mm. - Diamond-coated tool included Ø 80 mm x Ø 20 mm and 35 mm height. - To amend any cutting failures, ensuring panel squares and resulting in excellent gluing trims. - For cutting millers of until 0,5 mm in 60 mm height pieces, the maximum length is 1200 mm (check for bigger measures). - Straight gluer to apply glue on the panel 1,5 kg capacity. - Warm up system made by 5 electric resistances numbering 2200 W, with temperature control made with an electronic thermoregulatory controller. - Auto feeding system for roller edges. - Pressure zone for straight corners, assuring a perfect joint of the tape on the panel. - Paper knife, wooden blade, PVC or ABS, 3 mm maximum thickness. - Glue box with Quick-Change System. - High frequency motor 0,75 CV and 12000 rpm. 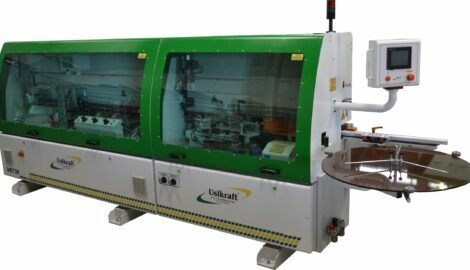 - Responsible for the accurate cut and trimming of tape pieces with straight or round corners, only if the round side of the panel is perpendicular to the belt line. - Ø 64 mm diamond-coated milling cutter. - For removing the tape excess on the superior and inferior parts of the panel. - Motor of 0,75 cv and 12000 rpm. - 0 to 35 vertical and sideline tilts. - Ø 64 mm diamond-coated milling cutter and Ø 63,5 mm suction nozzle. - Automatic adjustment with two positions 0,4 and 3,0 mm thickness. Access on the control panel. - It is used to obtain a perfect finish in PVC or ABS corners until 3 mm thickness. - Accurate adjustment of the edge thickness. - It eliminates any possible saliences left from the trimming group. - Appropriate to rip the drawer bottoms. - For channel opening 6 x 10 mm. - Floating input and output. - Included ripping tool of 6,5 mm. - Maximum distance 25 mm, from the glued part until the rip. - Ø 150 mm cloth disk. - It removes any wastes on the glued panel. - 7” screen, with touch screen panel and colorful screen. - Independent electric panel and CLP controlling entry and exit of groups. - Forward speed of varying belt from 10 to 20 m/min. - Linear amount of edge tapes used and produced pieces. - Temperature controller from 0°C to 225°C. - Obs. : The machine is unleashed when it reaches the exact temperature. - Automatic measure repairs in different speeds. - Security sensors groups (if disarmed, reasons appear on the screen). - Self-positioning System of the groups, when switching the tapes from 0,45 and 3,0 (two positions). It dismisses the manual adjustment. - Equipped with acoustic protection cabins. - Increases the operator safety. - Note: They don’t come with burn out hose, this material will have to be bought by the costumer. It doesn’t include torque wrench nor soft wrench.